New Film "Essene Bliss" with GRACE + Dan Winter, -beautiful exerpt online here. 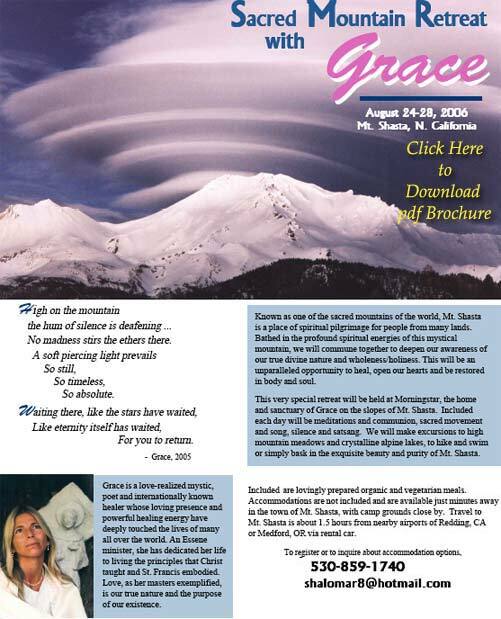 click here to read Grace telling us more about her Spiritual Story.- her Mystical and Bliss experiences..
Implosion Group is blissful to Present- Grace of Mount Shasta. 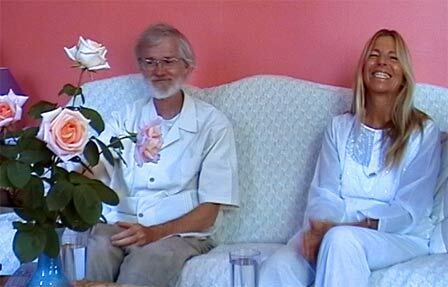 -Intro here - from Dan Winter: Our Teaching has always been about the science which supports the path to immortalizing BLISS. It is important for us to present an outstanding example of a life in BLISS. What the experience is like - in personal and vivid terms, and what the hygiene and lifestyle is. And perhaps most important to present the feeling quality - the loving orientation to LIFE which makes REAL bliss sustainable. Here is what the ultimate fractal coherence of a truely SHAREABLE wave - looks like in real life. 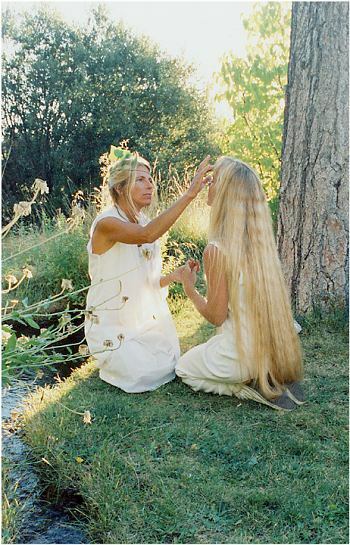 Grace has completely immersed herself in nature- and the Essene pristine lifestyle - from her own inner guidance - since she was very young. 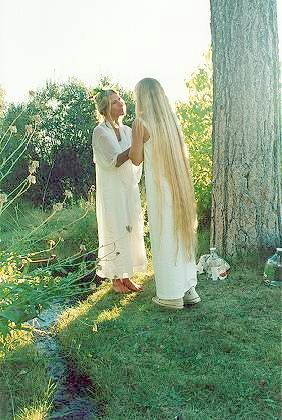 She is part Native American. 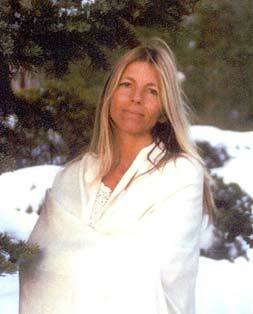 She is a recognized Essene Saint- and a true teacher of the path of bliss. Watch the film exerpt below to feel the REALITY of actual BLISS experience which allows you to see thru and enter the Sun as if it were your body. See the effect this would have on your life. Grace speaks with a coherent presence knowing what it is to trace the threads of her own BLISS moments - into the Sun- and - to trace a soul after death - and be the reality of Immortal Spirit based on compassion and love. Her Essene personal story is also exquisitely appropriate now that the Grail and Magdalene stories have been revealed to be actually the Egyptian descendants of AkunATUN / Moses - who is founder of the Essenes. The Righteous Teacher / Priest of the Scrolls is the Egyptian son Joshua / Jeshua - later called Jesus. (see table at THE REAL GRAIL - Implosion in Blood) . - comes directly from the Solar being. The REAL Christos is the PHYSICS of how human hearts and the Solar Heart - teach Waves of charge to SHARE perfectly. The quality of 'Grace' is the wave which carries the perfect fractal rose of love embedded in the perfect heart. Autumn in Europe: Grace will be in various places in Europe -this Autumn , including Munich - in Oct.
- more info soon - or contact us..
April - We are planning a magical dolphin retreat in Hawaii - if you are interested - do contact us .. 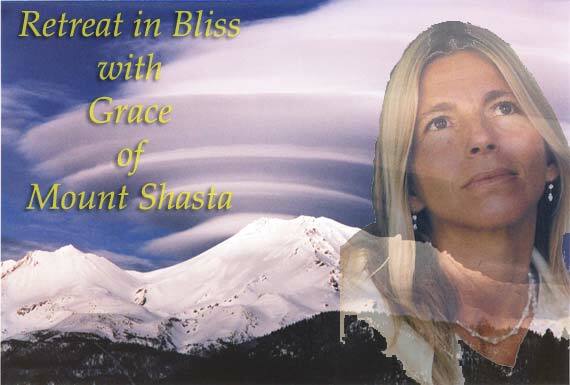 Messages with Grace from Mount Shasta CA. "Within every heart there is a yearning...for love. To know love is to know oneself; to return to our original innocence and to remember our oneness with All-That-Is." In this retreat, Grace will reveal the wholeness, oneness, and love that is in all of us. Through the teaching and guidance of Grace, we will heal our hearts. Closed bodies and minds will be opened. Separation and suffering will be transformed to love and light. This retreat is a return to our true nature, to why we are here in this world, "To love... to play... to be... simple, innocent and free." 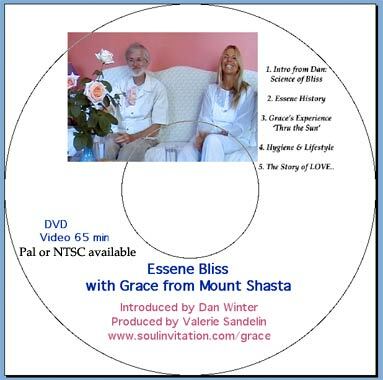 Grace is a Love-realized mystic, poet, teacher and healer whose loving presence and powerful healing energy have deeply touched the lives of people all over the world. 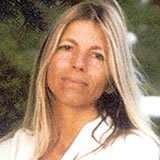 After following a Spiritual Path of meditation and silent communion in nature since the age of 14, in 1986 while under the stars on the big Sur coast, Grace experienced direct awakening into mystical union and cosmic consciousness. From this time, her life has been passionately devoted to healing and awakening consciousness on this planet from the dream of separation and suffering into Love realization. She is reknowned for her transcendent mystical poetry, and has for many years traveled extensively, offering healing and teaching all over the world. From the C.D. "Grace" mystical poetry ....by Grace -with music by Michael Hammer. i rest in you, my Self. that dreams the dream of otherness. like water thirsting for water, i realize I'am that. waits in perfect love beyond the dream. I 'am that One beyond your dream of being other. into that Home you have so sought. of an illusion held in your dreaming mind. worlds upon worlds of illusion. that you laid not here in Me. just a profound thanks to you and Grace for the outrageous beauty of this video! each road a royal road. The final triumph begins to resemble everybody.